One of Mexico's most popular beach destinations is a picturesque coastal resort area where you can rub shoulders with the rich and famous, or just enjoy a relaxing getaway while enjoying the striking scenery. 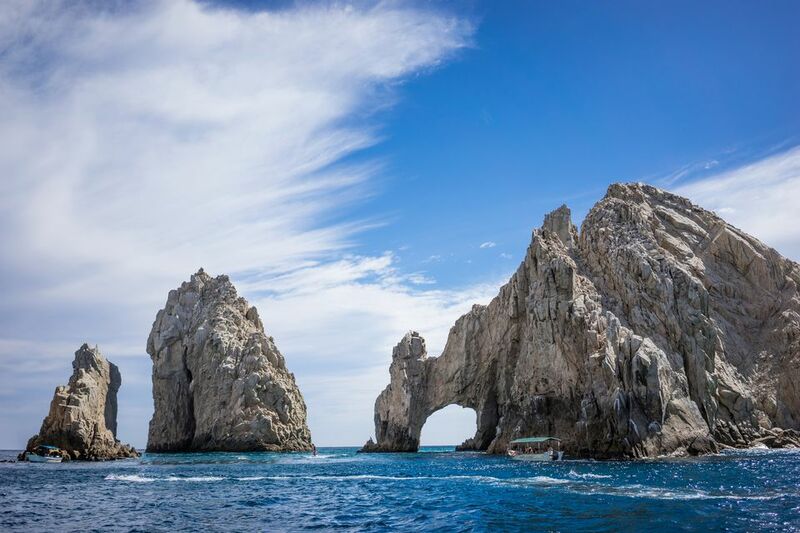 Located on the southern tip of the Baja California Peninsula in the state of Baja California Sur, Los Cabos, whose name translated means "the capes," has been gaining popularity as a tourist destination over the past 30 years. The area known as Los Cabos encompasses the towns of San Jose del Cabo and Cabo San Lucas, and the area between them which is commonly referred to as the "Tourist Corridor" or simply "the Corridor." This destination is well-known to be a favorite getaway spot of many Hollywood stars, who enjoy its dramatic setting and peaceful waters just like everyone else who travels here. The quiet colonial town of San Jose del Cabo was founded as a Jesuit mission in the 1700s with the purpose of converting the local Pericu people. Over time the town has also served as a military outpost and mining center. Now the Art District in San Jose is a great place to stroll in the evenings, and has many galleries and shops. In general, San Jose del Cabo attracts visitors who prefer a quiet, laid-back vacation in a traditional Mexican town. Take a virtual walking tour of San Jose del Cabo. Cabo San Lucas lies some twenty miles southwest of San Jose del Cabo. Thirty years ago Cabo San Lucas was a tiny fishing village, but now it is a booming tourist resort area with modern hotels, luxury resorts, upscale restaurants and an active nightlife. This is Baja California Sur's most popular tourist destination, and a great spot for practicing all types of water sports, sport-fishing, and golf. In the early 1970s the Transpeninsular Highway at last connected the Los Cabos area to Tijuana at the US-Mexican border. Surfers were the first to come to the area, followed by snowbird campers and sportsfishers. But it wasn't until the 1980s that the Mexican government agency Fonatur, which invests in tourist development, put its weight behind the infrastructure needed to make Los Cabos into the internationally known resort area that it is today. The main activities in Los Cabos center around the beaches and ocean. Parasailing, scuba diving and snorkeling are popular activities, and no tourist should miss going on a glass-bottom boat tour. Los Cabos is considered the marlin sportfishing capital of the world. Los Cabos has six major golf courses. Whale watching tours take place from December through March - read about a Los Cabos whale-watching expedition. An activity that you might not expect to find here, but is becoming quite popular is camel riding. The artist community of Todos Santos is an hour's drive from Los Cabos. This is a small picturesque town, and is protected as a Mexican national historic district. On a day trip to Todos Santos you can visit art galleries and shop for handmade textiles, handicrafts and folk art. Stop for lunch at the Cafe Santa Fe, which serves great Italian food in a beautifully restored hacienda. Here are some more Los Cabos day trip ideas. If you like to swim in the ocean, you may want to choose a hotel or resort located on El Medano beach in Cabo San Lucas, one of the destination's best swimming beaches. Just outside of San Jose del Cabo in the Puerto Los Cabos area is the Hotel El Ganzo, a 70-room boutique hotel with an artist-in-residence program. You'll also find the Secrets Puerto Los Cabos in this same area. Here are our picks for best adult-only resorts in Los Cabos. Los Cabos has many options for fun and entertainment after the sun goes down. Whether you come to Los Cabos to enjoy the vibrant nightlife, the stunning setting or just to relax by the beach, this is a destination that will leave you feeling relaxed and content. Where Does Jennifer Aniston Go When She Needs a Cabo Hideaway?